Churchill's are the house clearance experts. House clearing has been our expertise since 1974. We clear your home in the Bracknell area whatever your situation. Selling or letting your house? We make house clearance as stress free as possible for you. Churchill’s have over 30 years experience in clearing houses. 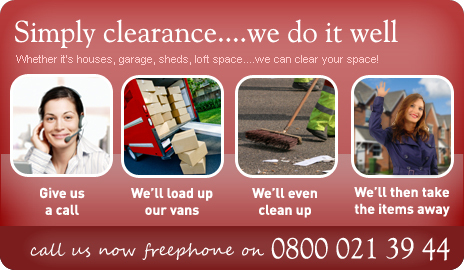 From houses to sheds, lofts to garages we can solve your house clearance needs. You get an effective service that will remove all items from your property with care. In a fast time frame of 3 - 4 hours. You get a professional responsive team that will show on the day with a large Bracknell van and trailer. You want a house clearance company that will if required will help to carefully clear all unwanted furniture, personal goods, and unplug and electrical appliances. You want a house clearance company that will provide you a valid invoice with all our business and tax details once your house clearance has been finalized. We do not accept cash in hand so please do not request it! You want a house clearance company that is punctual and polite. You want to find a house clearance company in the locality that will arrive on the date agreed and not let you down. A list of estate agents services are listed below for your area. If you are interested in our house clearance services then click the link. You may wish to find out more information about the listed probate solicitors. If you require punctual services then follow the link. Conveyancing solicitors in your area are shown below if you need their services. If you require our house clearance services then click the link.